The American Urological Association estimates that 30% of all men and 40% of all women live with OAB. At Advanced Urology Associates (AUA) we want to eliminate the stigma that has kept people from seeking help for this condition. OAB symptoms of urgency, frequency, and leakage are not normal at any age. They may occur more often as people get older, but that doesn’t mean they are a normal part of aging. The chances of experiencing OAB increase when a woman goes through menopause. The same is true for men who have had prostate problems. Other conditions can increase the risk of OAB, such as diseases that affect the brain and nervous system. Many people hesitate to seek treatment or may think that their symptoms are not serious enough to seek treatment. At AUA, we are committed to helping our patients and are here to assist them in finding a way to control, or stop, their bothersome bladder symptoms. Our OAB Nurse Navigator will work together with your Urologist to evaluate your symptoms and walk you through the treatment options available. Every individual’s symptoms are different and there is not a “one size fits all” medication or treatment that works for every patient. It is important to communicate with your physician and the nurse navigator about noticed improvements or unchanging to worsening symptoms after trying a treatment option. We ask you to be honest if a treatment is not working so that we can look at additional treatment options for you. Urodynamic testing is a test that tells your doctor how well your bladder stores and empties urine. This test is done right here in our office. At Advanced Urology Associates, we are committed to helping our patients and are here to assist you in finding a way to control, or stop, your bothersome bladder symptoms. 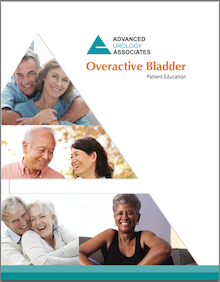 View Overactive Bladder (OAB) Treatments. Questions About Overactive Bladder (OAB)? If you have any questions about Overactive Bladder (OAB) treatments, or think a specific treatment is the right option for you, please contact us today at 815.409.4930 or request an appointment.